Graeme Morrison is confident Scotland can replicate their surprise victory on their most recent trip to Dublin in Saturday's Six Nations clash with Ireland. Scotland were set to make the journey across the Irish Sea on Thursday seeking a first win of the tournament after losses to England, Wales and France and facing the prospect of a likely Wooden Spoon decider against Italy on March 17 if they do not beat Ireland at the Aviva Stadium. The circumstances are similar to two years' ago, when they had lost all four previous matches in the tournament and required victory to avoid the Wooden Spoon before securing a 23-20 win in Ireland's final Test at Croke Park. Morrison said: "We'd not won going into that game, very much the underdogs, but we went and put on a brilliant performance against a very strong Irish team. That's what it's going to take this week as well. I've got full belief in the whole squad of 22 guys. "I firmly believe they all do as well. It's just putting together all the pieces into one performance. I believe that if we do that then we'll turn them over. There's a pretty confident feeling in the squad." Scotland's focus is delivering for the full duration of the 80-minute match and eliminating errors which have proved costly in the tournament thus far. Scotland travel to Ireland seeking to arrest a run of five straight Test defeats - the longest winless run since 2004 - and to improve head coach Andy Robinson's record of two wins in 13 Six Nations matches in charge. The damning statistics have led to speculation over the future of Robinson, who is under contract until after the 2015 World Cup. While Saturday's match could be key in determining Robinson's future, Morrison insisted it has not been weighing on the players' minds. "It's not something that's been discussed at all," he said. "We're in the middle of a Six Nations tournament and have to focus on the rugby side of things." 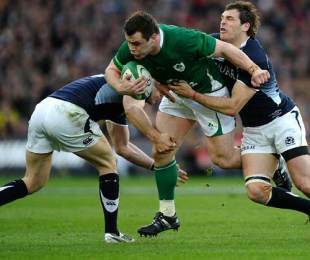 Asked if Scotland need to win to justify Robinson's faith, Morrison said: "Absolutely. He's put so much into turning us into the team that we are, a team that I believe can beat most rugby sides in the world. It's just putting it together to show we can do it."